One more look at the Lion's Gate Bridge. Because of the heavy traffic on a three lane bridge, the middle lane switches directions to carry commuters into the City in the morning and back to the suburbs in the evening. In the photo we can see that the deck of the three span suspension structure is stiffened by a truss and the deck of the approach spans is supported on plate girders. 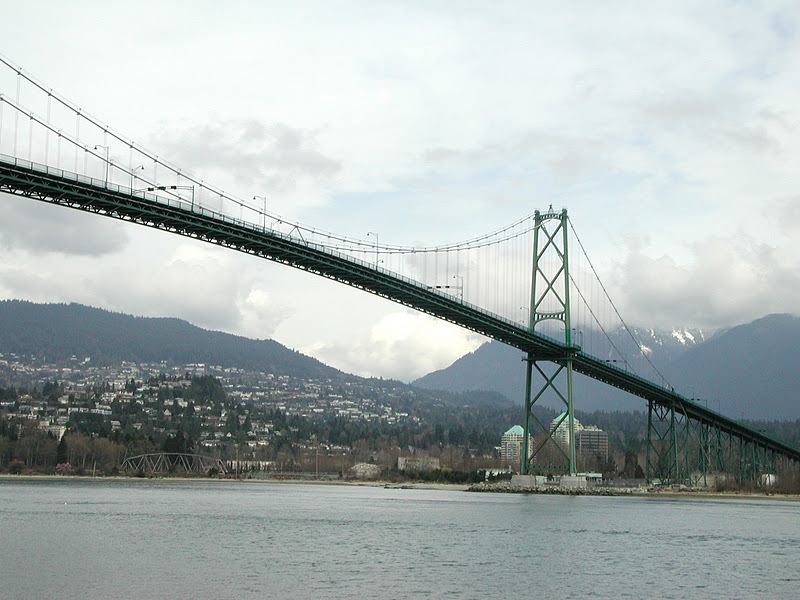 The approaches climb steeply in order to lift the deck 61 m (200 ft) above Burrard Inlet in 760 m (2500 ft). A large concrete block under the approach spans is used to anchor the suspension cable on each side of the bridge. The main span is 472.75 m (1552 ft) long and the side spans are 187.28 m (615 ft) in length. The towers and approach span piers look very flexible, especially in the longitudinal direction. Undoubtably, the suspension cable is used to provide longitudinal stability to the bridge. I would imagine that time lapse photography would show quite a bit of movement of the deck. The bridge received a lot of work from 1990 to 2001 to replace the rusted north approach deck, to widen the suspension deck, and to prevent serious damage from an earthquake likely to occur in the next 475 years. It would have been easier and cheaper to have replaced the bridge with a tunnel or another crossing, but apparently the public is politically astute and very motivated and so they opposed all the proposals to add a bridge, add a tunnel, replace the bridge, etc. The bridge was retrofitted to rock during the design earthquake. This is a strategy that has often been used as an inexpensive way to protect existing long-span bridges. Some engineers (most notably Prof. Nigel Priestley at UC San Diego) think that rocking is a perfectly reasonable behavior for bridges during earthquakes. However, a few engineers (most notable Prof. Nicos Makris at UC Berkeley) think that rocking is less likely to occur and that there are errors in the simple analysis procedure that Priestley proposed. We are currently having research done (by Prof. Bruce Kutter on the giant centrifuge at UC Davis) to see if our rocking assumptions are reasonable. An interesting article about the retrofit of the Lion's Gate Bridge was written by the Engineering News-Record and is available on-line. Vancouver's Bridges: Lion's Gate Bridge (2) by Mark Yashinsky is licensed under a Creative Commons Attribution-NonCommercial-ShareAlike 3.0 United States License.